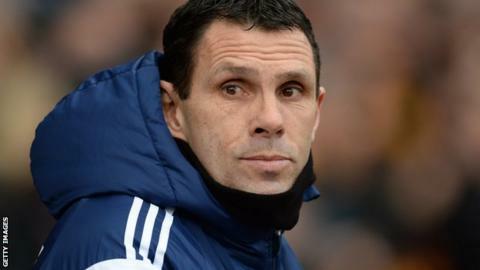 Former Sunderland boss Gus Poyet has been named as manager of Greek side AEK Athens. The 47-year-old was sacked by the Black Cats in March after winning one of his past 12 Premier League matches. Poyet, who previously managed Brighton, had been linked with Aston Villa following the departure of Tim Sherwood on 25 October. He brings coaches Mauricio Taricco and Charlie Oatway, having worked with both at Sunderland and Brighton, with him. AEK are third in the Greek Super League with five wins from their first eight games. Stelios Manolas was appointed interim head coach following Traianos Dellas's surprise resignation this week after the 4-0 derby defeat by leaders Olympiakos.